How do we specialize in groups? Friendly booking process: Our professional reservationists provide consistent, clear communication and a soft touch. All-inclusive pricing policy: Pricing includes gratuities for all guides and drivers. Lenient booking timeframe: We'll give you plenty of time to confirm your group members by holding space on a first-right-of-refusal basis before requesting a deposit. Sign-up forms: If requested, we will create a customized sign-up form for you to distribute to your group. Door-to-door service: We will pick up and drop off right at your hotel doorstep. Our guides always arrive early with all relevant equipment already on board. A head guide or company manager will organize the departure to ensure smooth handling and punctual trip timing. Quality, consistency, confidence: From your initial booking inquiry to the post-trip guest drop off, you will know you are in good hands. 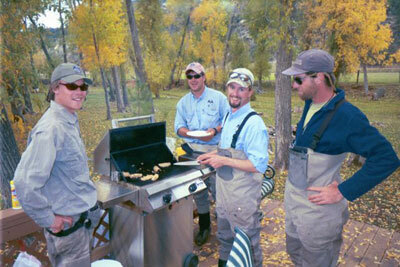 Telluride Outside provides a level of service and communication unmatched in the guiding industry. Confidentiality: Telluride Outside is proud to be the choice of a long list of individuals and families who require complete anonymity. You can trust the discretion and professionalism of our staff and owners. Capacity: Over 28 years, we've built the capacity to handle substantial groups with each guide service. We frequently host parties of 50 to 100 guests per trip and can manage more with sufficient notice. Experience: Over 28 years, we've learned what it takes to conduct first-class guided experiences for special groups, weddings and corporate events. Our owners, managers and guides are especially tuned to the needs and interests of special groups. 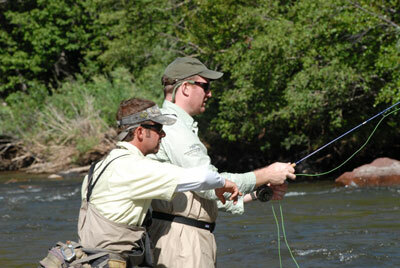 Fly fishing is a classic Colorado adventure for your whole group. We are proud to run one of the most resourceful fly fishing guide services in the United States, with ten exclusive private water venues and more than 100 miles of public water on some of the finest trout streams in Colorado. 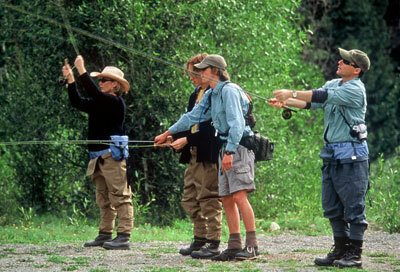 Our guide staff has been developed over 29 years and now consists of more than 30 of the finest guides in the industry. We regularly host large groups, providing a memorable, compelling experience for every participant with superb individual instruction and a low guest-to-guide ratio. Top-quality equipment is provided for everyone, including Scott and Sage fly rods, Ross and Lamson reels and Simms breathable waders. Half day and full day trips are available for all groups. Our single most popular group activity is our half day 4-WD tour to Imogene Pass and Tomboy ghost town. This fabulous tour is well-suited to everyone in your party because it is an "intermediate" 4-WD road that reaches spectacular elevation (13,110 feet) and visits Tomboy, the most important historical site in all of Colorado. Our knowledgeable guides are masters of Tomboy's mining history - guests uniformly enjoy that part of the tour. The route offers unparalleled views of the San Juan Mountains, including several 14,000 foot peaks and unobstructed vistas of Telluride, nestled in its box canyon over 4,000 feet below. Imagine a group photo at 13,000 feet! We drive in beautiful new vehicles converted with special seating canopies for maximum comfort, safety and optimal viewing. Another popular choice for groups is our half day trip to Ophir Pass and Alta Ghost Town. This is a fairly relaxed 4-WD route that still climbs above tree line and visits Alta, the town site made famous by becoming the first place in the world to utilize alternating current electricity (generated at Ames, just down the mountain). WEDDING TRANSPORTATION: Telluride Outside will transport your wedding party to and from your special event in our rugged, stylish, comfortable offroad vehicles. Popular sites include the Gorrono Ranch and Alpino Vino on the Telluride Ski Mountain, the spectacular wedding site at Greyhead, the Alta Observatory and Bridal Veil Falls. SCAVENGER HUNT: Great for weddings and team-building! We incorporate colorful elements from Telluride's mining history in a half-day 4-WD scavenger hunt in which our guests decipher clues leading to Telluride's famous landmarks, such as "the first bank Butch Cassidy robbed" and "Colorado's highest waterfall." Entertaining, scenic and memorable, our scavenger hunts are a proven winner for lighthearted team-based adventure competition. Please inquire for details and example clue lists. Is there anything more fun than whitewater rafting with your friends and family? 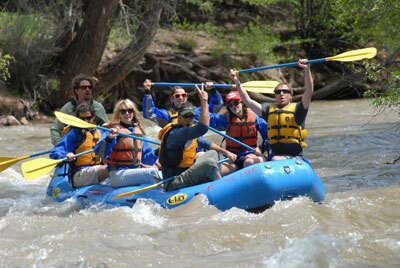 The San Miguel River offers excellent rafting just a few minutes from Telluride. Half-day trips (recommended for groups) cover approximately 9 miles of class II-III whitewater in about 2 hours in the beautiful Norwood Canyon of the San Miguel. The San Miguel is ideal for groups because it's a splashy, intermediate river with lots of small rapids that require good paddling teamwork, but not the intimidating rapids found on class IV and V rivers. We raft every morning and afternoon, with transportation departing from Telluride around 8:00 am and 1:30 pm respectively. Our capacity for most rafting trips is 30 guests, but with advance notice arrangements can be made to accommodate 60 guests. Telluride through the lens of the beholder: soaring peaks, alpenglow, waterfalls, wildflowers, aspens, historic ghost towns, rivers, canyons, wildlife and people; Telluride's appeal encompasses all of Southwest Colorado and an inexhaustible range of subjects. We tour from downtown Telluride to the highest mountain passes in America, the most famous historic mining camps in Colorado, the forests of aspen and fields of wildflowers. We also photograph Black Canyon National Park, the San Miguel, Dolores and Uncompahgre Rivers, herds of elk, soaring birds of prey and the trout that swim in our streams. We tour in the summer, fall, winter and spring, as each season casts unique highlights on the natural features of the land. On each trip, we stop at length to photograph key elements of the landscape and other points of interest. Our professional photographer familiarizes guests with each site and provides coaching for optimizing the photography opportunity. Beginners are welcome! Price includes: guide, transportation and gratuity. Guests need to bring their own cameras and tripods, if they have them. Tripods may be borrowed with a little advance notice. 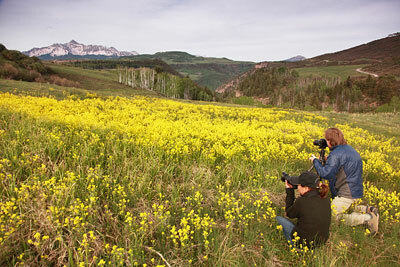 Telluride Outside frequently organizes customized photography workshops for groups with specific instructional interests. Workshops will typically incorporate classroom time for photo critique and technique instruction in addition to photography time in the field. Please inquire. Telluride Outside's fabulous snowmobile tours are the best winter group adventure offered in Telluride. We accommodate groups of approximately 24 guests simultaneously (even more counting double riders) for our half day trips, offered every morning and afternoon. Snow suits, boots and goggles are provided for customers who do not own ski apparel. Our courteous, professional guides run first-class tours in the spectacular Fall Creek/Beaver Park area, located just 30 minutes west from Telluride by vehicle. Transportation is provided in our safe, comfortable vans equipped with studded snow tires for winter driving safety. Everything about these tours will impress your group: stunning terrain, top-quality snowmobiles, the professionalism and personality of our guides and our attention to your safety and comfort throughout your tour. 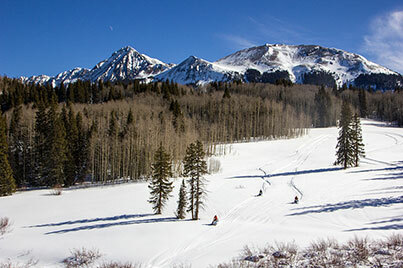 Many of our guests say that their Telluride Outside snowmobile tour is the best day of their ski vacation. Ride-along photographers and catering are popular amenities to group activities. Please inquire for referrals. These are group prices, all-inclusive, assuming 10 or more participants. A $25 per guest deposit is required to confirm a reservation. Cancellations are not accepted within 7 days for group reservations and we do not cancel for foul weather.